Sharing your Klout list via Facebook is easy. When you share in this way, Klout creates a Facebook Wall (Timeline) post that’s visible to anyone who views your Facebook Timeline or your News Feed. From there, when they click your link, they are directed to Klout. Open your list by clicking the name in the sidebar on the left side of your screen. Click the Facebook button from the social sharing buttons in the upper-right side of your screen. A pop-up box with your Facebook post appears. You may customize your Wall (Timeline) post by typing in the provided message field or post the update with no additional text. Click the Share button to post this message to your Facebook Timeline and return to your Klout Friends page. If you don’t wish to share your Klout link with everyone who views your Facebook Timeline, you have the option (as explained in the list that follows) to customize your audience within Facebook. 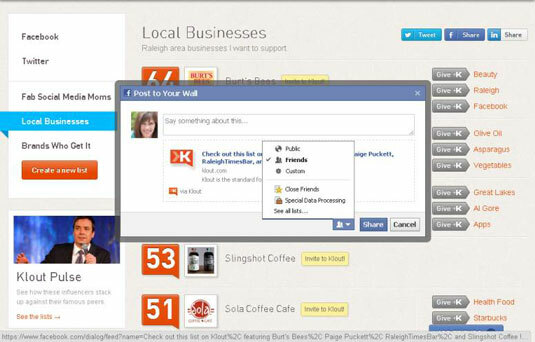 This option might be helpful if you want to engage only a certain group of friends or business contacts. To customize your Facebook message recipients, follow the above instructions through Step 3 to create your Wall (Timeline) post. Then use the following steps to customize the recipients of your post. To the left of the blue Facebook Share button, you’ll notice a small Privacy button with an arrow. Click this button to customize the Facebook friends who see your update. Choose the group of people with whom you’d like to share the list. 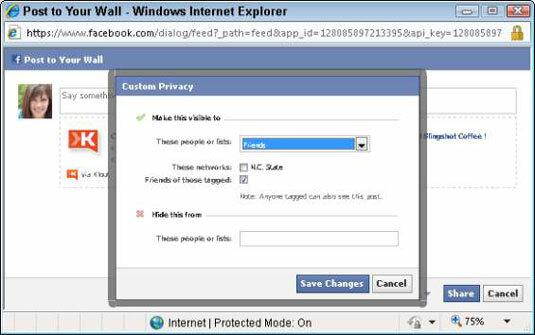 Public: The default setting will match your privacy settings in Facebook. If you wish to publicly share your list, select the globe icon to make your Wall (Timeline) post visible to anyone whether or not you are Facebook friends. Friends: Select the icon with the people on it to share your post with all of your Facebook friends. Custom: Choose the gear icon to customize your recipients by name or network and select from one of the available options when the Custom Privacy dialog box appears. To share your post with a specific network, select the check box for the appropriate network and click Save Changes. To share your post with only specific individuals, choose Make This Post Visible To specific people or lists from the drop-down menu and type in each person’s name that you wish to see your post and click Save Changes. List: Notice that you might have additional selections, depending on how your Facebook account is set up. Within your Facebook account, you can set up customized lists of people so that you can quickly and easily choose who sees your posts. Setting up Facebook lists is beyond the scope of this book, but you can consult the Facebook Help Center for more information. After you have made your desired sharing selections, click the Share button to complete your Facebook post and return to your Klout Friends page.